Yes, that's right! Australian Football League Italy! Late in 2009 I was approached by a group of passionate Italian Australian Rules Football players who had just come back from the 2009 Euro Cup in Samobor (Croatia) where they had managed to pull a team of Italians together to play and represent Italy in their first Aussie Rules game in the Euro Cup. They ended up 13th out of the 15 teams in the competition. This group of passionate amateur Aussie Rules players were so motivated to bring Aussie Rules to Italy and they approached me to help them launch AFL Italia. Their idea was to form a small league of 3 or 4 teams, Milan, Rome, Genova and Lugano, just outside the border of Italy in Switzerland but really still Italian ;). I headed to Australia in early 2010 to promote the cause, seek sponsorships and hold discussions with the AFL in Melbourne about supporting AFL Italia and the growth of Footy in Europe. Unfortunately the AFL had other ideas and didn't see the future of the development of the game in Europe 🙁 But not being easily disillusioned I carried on and approached individual AFL Clubs to seeking their support. Most of the AFL Clubs were interested and keen to discuss this opportunity, however only a handful of them provided any actual support. 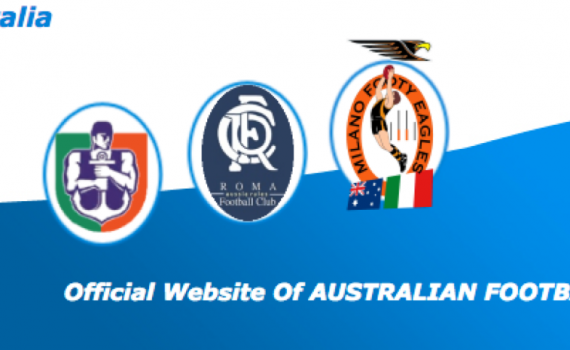 The greatest support came from the Fremantle Dockers who instantly recognised the important cultural connections between Fremantle and Genoa and offered to establish a "Partner Club" connection with the newly formed AFL Italia Genoa. David Crute, the then Community & Cultural Development Manager at the Fremantle Dockers provided the Genoa team with footy jumpers, shorts, socks and balls and shipped all this to Italy at their own expense! They also had their CFO, during a fleeting Europe holiday he was on, stop into to meet the Genoa Club Committee and sign off on the partnership. The Genoa team declared themselves as the Genoa Dockers and a great relationship developed. We tried to arrange similar relationships, however were unsuccessful at establishing other partnerships, although in 2012 the Milano Magpies changed to the Milano Eagles as they finally secured a partnership with the West Coast Eagles. Port Adelaide were also extremely supportive and promoted a number of fundraising initiatives through their big Italian Community of members. The first season of the AFL Italia leagued kicked off in early 2010 and saw a 6 round season culminating in the playing of the very first AFL Italia Grand Final held in Rome between the Milano Magpies and the Roma Blues, with the Roma Blues taking out the first ever AFL Italia Premiership by 21 points over Milan! After the success of establishing the league early in 2010 the AFL Italia founding members decided to bid to host the 2010 Euro Cup and also lodged a request to the organising committee to host the first ever game of Female Aussie Rules in Europe! AFL Italia won the bid and the right to host the 2010 Euro Cup in Milan and as a result we continued working together to ensure a successful event and spread the word about Aussie Rules in Italy. More about the successful 2010 Euro Cup hosted by AFL Italia in Milan can be found on our 2010 Euro Cup page. How this came about was that a group of Italians, led by a footy crazy Ital-Australian from Pescara decided they’d enter into the 2009 Euro Footy Cup being held in Zagreb, Croatia. They managed to pull together 20 keen Italians (young and old…), roughed up a team logo and bought uniforms and tracksuits and headed off for their first ever Aussie Rules Euro Cup experience. Finishing 13th on the day (15 Teams competed) and having so much fun they all decided they wanted to make Aussie Rules in Italy a reality.